This sounds delicious! I definitely want to try this soon. Thanks for sharing the recipe. Cara, I don't see why not, but I'd wait to add the cilantro until you're ready to serve it. It also keeps for several days in the refrigerator. Perfect Timing! I'm always looking for a great salsa! I can't wait to try this! Well from what I can see from here, this certainly looks like the perfect salsa! I too prefer the flavor of tomatillo over traditional salsa. 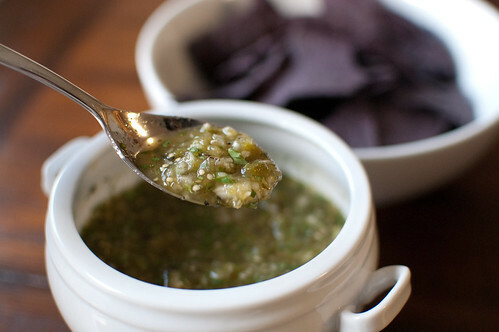 I can't tell you how many times I've looked for a great tomatillo salsa recipe and I've never found one that looked very inspiring. This looks perfect! I have a few tomatillos around that I need to use up. How could I possibly resist the perfect salsa?? Making this immediately - thanks for sharing! Found the recipe via tastespotting and made it last night for a party--everyone loved it. I left out the cilantro as I can't stand the stuff and the salsa still came together very well. Also added a splash of balsamic vinegar to pop the flavors out a bit. Thanks! I'm guessing this comes out spice because of the jalapeno. Do you have a suggestion for a substitute to make a milder version? Because the jalapeno is roasted and then the seeds and ribs are removed, it's not that spicy. If you are worried about the spice level, maybe just add half the jalapeno? Or you could try using a poblano instead - they are milder peppers. Hope that helps! I have been SEARCHING for a salsa recipe like this! 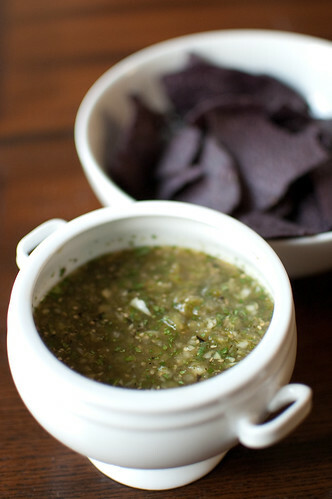 I used to know someone who made the most amazing salsa (and I don't even like salsa and I couldn't figure out what the missing ingredient was... the tomatillos! Thank you, thank you, thank you!! !